Saut dans le vide, (Leap into the Void), by Yves Klein. Yves Klein (1928 – 1962) is considered to be one of the most noteworthy artists to emerge in the mid-20th century. He was one of the founding members of a brief but distinct art movement called Nouveau réalisme (New Realism) which sought to distinguish itself from abstract painting by returning to “reality” in its subject matter via direct appropriation of images or materials. Many critics also see him as a successor of Marcel Duchamp, another rogue and playful artist who also crusaded against traditional sensibilities surrounding painting and sculpture. Although Klein died at age 34, during his years in the art world he produced a great deal of work that was both influential and highly controversial. From a young age the artist had a powerful fixation on what he called “the Void” – a nirvana-like state free from thought or sensory information in which he found peace and inspiration. His attempts to share this experience with his audience resulted in a large body of work painted in a single vibrant hue (later patented by the artist as International Klein Blue), and eventually in a show entitled The Specialization of Sensibility in the Raw Material State into Stabilized Pictorial Sensibility, The Void, wherein he repainted every surface in the gallery room white and invited viewers to experience the empty space, claiming that his paintings were “now invisible”. 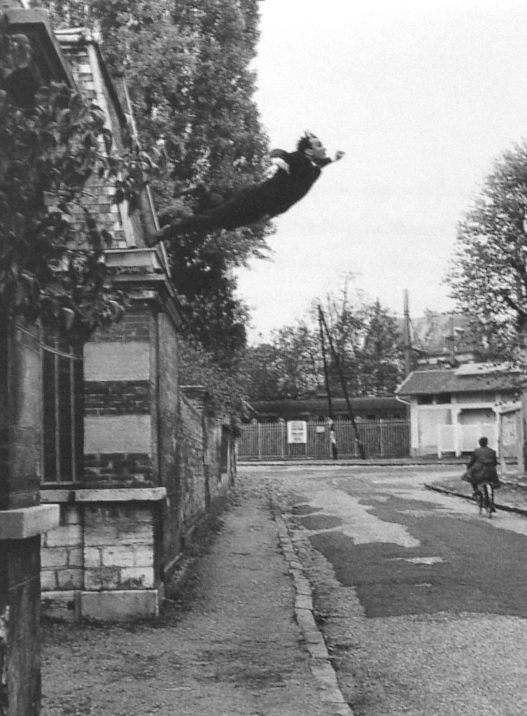 Possibly Klein’s most controversial piece is the above photo-montage, Saut dans le vide (Leap into the Void) which depicts the artist leaping from a wall toward the empty pavement. Klein originally represented this piece as complete and unedited truth, and even created and distributed throughout Paris a fake Sunday newspaper prominently displaying this “documentary” photograph. Klein also cited the work as evidence of his ability to levitate, a skill which he claimed to have had since an early age. In fact, the large tarpaulin which Klein used to land on was simply removed from the final image. In a final act of irony however, the artist insisted that an alternate version of the photograph be used in an upcoming gallery show. The first image, used in the fake news publication, Dimanche, included a cyclist as well as a train passing in the background; the second version omitted these details. Klein openly challenged his viewers’ experience of reality, as well as the supposed inviolability of truth in news media and photography. The work was simultaneously held up as truth and exposed as untruth, not only through the visual elements of the piece itself but by the way in which it was represented in Parisian newsstands and the gallery wall in Krefeld. As such, it is one of the first works of art to exist so fully in the space between reality and fiction – a space which is both conceptually abstract and visually accessible – perhaps able to be called “the Void” which Klein sought so sincerely to invoke in all of his work.